After the Indian government unilaterally halted movement of the Nepali product for two weeks and hence on Thursday Ginger exports to India resumed. In the eastern region through the Kakarvitta border point Traders are exporting the high-value spice produce. The President of Nepal Ginger Producers Association, Mr Gopal Gautam in Makwanpur told that after traders were permitted to do so by Indian authorities, they have started exporting ginger. on Thursday and Friday, it is reported that nearly 50 trucks of gingers were exported. From Makwanpur to India via Kakarvitta750 tonnes of gingers were shipped, said by Mr Gopal Gautam. As there is the halt in exports, 300 tonnes of ginger are still stranded at the warehouse in Makwanpur where as nearly 40 tonnes of ginger had become spoilt. Due to the constantly changing policy by India, traders are facing difficulties, said by Gautam. By the inconsistent trade policy of India, Both traders and producers have been affected. Annually 6, 425 tonnes of ginger produced by Makwanpur district and Of the total output, only 5 percent ginger is consumed by the local market. The rest ginger has been exported to India. As per the traders, there is a significant decrease in the price of Ginger. So they can’t buy even Rs20 per kg. In Makwanpur on 421 hectares, ginger is produced. Nepal Ginger Profile 2016 produced jointly by UK Aid-funded Samarth-Nepal Market Development Programme and the Nepal Ginger Producers and Traders Association reported that by investing more in research and development if substantial improvements can be made in yield, quality and volume the spice has huge overseas trading potential. Small trading hubs in India will continue to be major markets for local ginger, even without a substantial improvement in quality, said by the report. After China and India, globally Nepal is the third largest ginger producer. Nepal’s total ginger production reached 235,000 tonnes in 2012-13 and among them, 60 percent was exported. 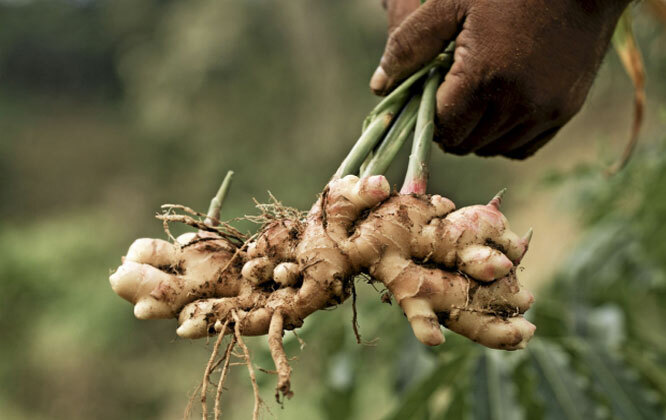 For Nepali ginger, India is the main export market. 94 percent of Nepal’s fresh ginger and 6 percent of processed ginger were brought by the southern neighbour. Nepali ginger contained traces of harmful pesticide, so in the last session too, claiming this Indian authority had halted Nepali ginger exports to India. But there was a test made for these Nepali gingers and it did not show any harmful pesticides. Hence on the import of ginger from Nepal, India subsequently lifted the ban. Indian traders alleged that ginger exported from Nepal was originally made in China, mixed with Nepali product and then exported to India.